The complex, ever-changing world of fraud is making it nearly impossible for most people to identify online threats and adequately protect themselves. Dupaco takes seriously our responsibility to help protect our members from fraud. To that end, we partnered with IBM® Security to offer Trusteer Rapport — protection against financial malware (malicious software) designed to steal personal and/or financial information while the user is online. And the best part? We're offering it to our members for Free! Refer to the steps below for guidance on downloading the Trusteer Rapport software to your computer, or visit Trusteer Support for additional help. Trusteer Rapport software is available for download ONLY within Shine Online Banking, and ONLY after log in. A download window will display (see the image on the right). To protect your login credentials and financial information from financial malware and other online threats, you should proceed by clicking Download Now. Depending on which internet browser you’re using, you’ll be asked to run, save or download a file named RapportSetup.exe to proceed with the download. Once the Trusteer Rapport software has been downloaded to your computer, locate and open the RapportSetup.exe file. After doing so, on-screen instructions will help you proceed with the installation of the software. Dialog boxes will communicate the success of the installation, or any road bumps encountered during installation, and how to proceed. Following a successful installation of Trusteer Rapport, a setup wizard will walk you through acceptance of the terms and conditions of use, and will get you on your way to being protected from financial malware and other online threats. Why did Dupaco select this software? Trusteer Rapport is owned by IBM – a trusted name in security solutions. After thorough research, Dupaco concluded the company and the software meets our safety and security standards. How will this software be made available? Trusteer Rapport will ONLY be made available for download through Shine Online Banking after your successful log in. For more information on this, please read on. Why is Dupaco asking me to download and run this software? Dupaco takes exhaustive steps to protect the information transmitted when members use online banking so that it is not intercepted by unauthorized parties. With the addition of Trusteer Rapport software, the computers our members use can also be protected against potential risks of financial malware that other antivirus software is not designed to combat. No. As an alternative, you can close the download window, or choose Remind Me Later. Because we feel strongly that this software will offer you added fraud protection, those who skip the software download will be presented the Trusteer Rapport download splash window every seven days while logged in to Shine Online Banking. How can I be assured the download file is safe? Typically, we would tell you to avoid downloading files from the internet, especially if you do not know the file’s origin. Therefore, for your protection and peace of mind, we’re making the file download for Trusteer Rapport available ONLY within Shine Online Banking. After log in, you’ll be presented a window with the option of downloading the Trusteer Rapport software. What does it mean if I see the download window even after I’ve downloaded Trusteer Rapport on my computer? It is likely that your installation of the software was unsuccessful or incomplete. In this case, click download, and follow the steps at left all the way through set up. Should I download and install Trusteer Rapport on all the computers I use? Yes. When you log in to Shine Online Banking from a computer that has not yet been protected with Trusteer Rapport software, the download window will appear, prompting you to download the software. Will I pay anything for the download or use of the software? No. Dupaco is making Trusteer Rapport completely free to members who are enrolled in Shine Online Banking. Must I launch Trusteer Rapport each time I use my computer? No. Trusteer Rapport will automatically run in the background on your computer at all times, unless you stop or uninstall it. What types of fraud does Trusteer Rapport protect against? Financial malware: Automatically and silently downloaded onto the computer when browsing the internet, malware is a type of virus that silently captures login information and transfers it to criminals as the login is performed and can also alter executed transactions without being detected. Phishing attacks: Criminals build fake websites that look very similar to a financial institution or e-commerce website to lure the user into submitting online banking login information or other sensitive data. This is later used to access the user’s account or make unauthorized purchases. Is this software compatible with Macintosh and Windows operating systems? Yes. A thorough and up-to-date listing of compatible operating systems can be found at www.trusteer.com/support. Stop phishing attacks from stealing your login credentials and data. Is the software capturing or storing any of my credentials or account information? No. Trusteer Rapport will capture your Shine login ID; however, your login ID is stored in encrypted format and cannot be decrypted by IBM Security. What’s the difference between Trusteer Rapport and other malware or virus protection? Whereas most antivirus and malware solutions will not protect against financial malware, Trusteer Rapport is optimized to protect against financial malware that steals login credentials and financial information. Should I remove any existing antivirus program from my computer after I’ve downloaded Trusteer Rapport? Definitely not. Antivirus programs can protect against viruses that interfere with or slow down a computer. Therefore, antivirus protection should be used in conjunction with Trusteer Rapport. Is all Internet activity protected by Trusteer Rapport? To know whether the webpage you’re visiting is a Trusteer Rapport-protected page, look at the web browser’s address bar, where the Trusteer Rapport arrow will be displayed. If the arrow is green, it IS a page being protected by Trusteer Rapport. If the arrow is grey, it IS NOT a page being protected, in which case you can click on the grey arrow and select “Protect this website”. This action will ensure that all activity on this page will be safeguarded by Trusteer Rapport. A webpage protected by Trusteer Rapport will display the GREEN arrow. Will Trusteer Rapport tell me if it has detected and/or taken action against malware threats? Yes. Trusteer Rapport delivers information on threats and may recommend actions to take. This information can be viewed through the Trusteer Rapport console, accessible by clicking on the arrow near the web browser’s address bar. Will running Trusteer Rapport slow my computer down or interfere with any other computer programs? Performance speed will not be affected. In some cases, Trusteer Rapport will warn you that a particular webpage you’re trying to reach may pose a risk, in which case you can decide whether to proceed. In addition, for added protection Trusteer Rapport will obstruct behavior that is often used by malware, such as taking screen captures of browser windows. In these instances, you may be able to adjust the settings in the Trusteer Console, or you can manually stop Trusteer Rapport from running. These actions will reduce the level of protection, or stop protecting the computer altogether if you opt to stop running Trusteer Rapport. Is Trusteer Rapport available for mobile devices? No. 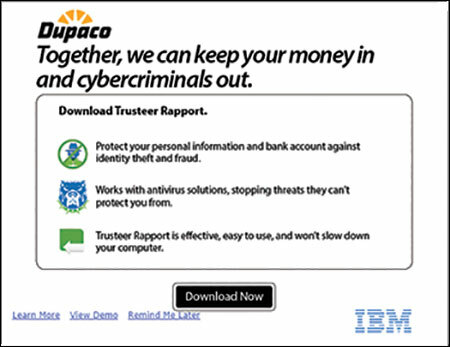 At this time, Dupaco is offering Trusteer Rapport to protect desktop computers only. Must I install software updates? No. Trusteer Rapport will automatically run updates; no action on your part is required. Where can I turn for answers to questions about the software download, installation or performance? A robust question-and-answer bank exists on the Trusteer Rapport website at www.trusteer.com/support. Through this website you can also chat with Trusteer Rapport experts or request a return call from their support team. Trusteer Rapport staff will never ask for your Dupaco account information. Does the security program work with iPads and tablets and mobile smartphones (including Blackberrys)? There is an app for iOS and Android. However, it acts like a web browser so if you use Dupaco�™s app, you would not be able to access our app with Trusteer protection. Instead you would need to access our mobile website m.dupaco.com through Trusteer�™s app, thus your interaction with our mobile website would be protected. If the blackberry is running an Android operating system (OS) then the Android version will work as well. If it is running the Blackberry OS it will not. I recently saw that trusteer was protecting the best crossword site (KCRG puzzle). After some comments with Trusteer the problem was found to be the character replacement portion of the program. When trying to input answers into the puzzle, it started with a capital A, then B, then C, etc. Solution from them was to say never in drop down box for character replacement. Now I have no protection for numbers entered for online transactions. Asked them if they could separate characters from numbers in that option. Thought you should know of this problem. I wonder if other messages or information was changed when sending to other sites. Hi Otis, you can turn the Trusteer off on a site-by-site basis by right clicking on the Trusteer symbol on the address bar and selecting the option to turn it off. Why does this gobble up so much of my hard drive? I had to delete it because it was consuming over 3 gig on my already full drive. When will a version be made for Linux? Will this "clean up" any malware that may be already on my computer? Or will it just protect going forward? Hi Lizz, This will not clean up malware that is already on your computer but it will notify you if you do have malware on your computer. Linda, Trusteer Rapport is completely free to Dupaco members. I currently have "malware" protection Will your product still be safe to install? Bruce, Absolutely. Trusteer is an additional form of protection that will not affect the way your current protection works. Hi Bruce, The total download size for Trusteer is 70 MB. I logged into Shine a couple times and the download window never popped up. I made sure that pop ups were not being blocked. Jay, The most common cause for this is accidentally dismissing the splash screen, or having a browser plug in that is disabling it. The easiest solution will be to use the link on the right hand side of the Account screen instead of the splash screen. Please click on the Trusteer graphic where it says Download Now. How can I tell if it downloaded? I clicked the download button, but nothing seemed to happen other than the download screen disappeared. I exited and came back in and never got the option to download again. The initial download is the installer, which much be launched after download. How you do that will depend on your internet browser version and setup. Internet Explorer will generally pop a yellow bar at the bottom of the screen with a Run button. Firefox will generally place it in a blue down-arrow at the top. Chrome generally places it in the lower-left of the window. After you execute the installer, it will download further installation files and walk you through the setup. Once it is running, you will see a gray or green box with a white arrow at the top of your browser window, by the address bar. I cannot get into my bank account ever since I downloaded this. I want it off my computer so please help me get it off of here. Will this software interfere with my existing virus protector software? John, It shouldn't. It's just additional protection. If it does interfere with your current software, contact us asap and we'll have our IT team take a look! I use my iPad and iPhone for mobile banking much more than my desktop. Any news on how soon Trusteer will be available for them? How about the Mac Air laptop? Hi Nancy, At this time we are unsure of when Dupaco will offer Trusteer to mobile devices. We will let you know as soon as possible if/when we start to! Is this software proprietary only to Dupaco members? Yes, Ron. Currently, Dupaco is only offering Trusteer for free to its members. Will Trustee Rapport (IBM) be mining our information for sale to advertisers or for other nefarious purposes? Is the software compatible with my iPad? Beth, At this time, Trusteer is only made available to desktop computers. Will this someday be a requirement? There's no way I'm installing this. This software hooks into basically my entire system at a very low level - otherwise it would not even be technically possible for it to do what it claims to do in the name of security. You're asking me to install what amounts to spyware in an attempt to combat spyware. Sean. You are correct that Trusteer operates at the driver level, as all anti-malware systems require low-level access to your system to protect it from rogue operations. I have been using Rapport on my PC and Mac for several years, with no ill effects. Is there any additional cost for this? Meri, Trusteer is completely free for Dupaco members. Will we be required to change passwords or login ID's, or have additional logon information to get to our account information. Also, will any of the steps or requirments change to transfer or access information? Hi there, Your username and password will remain the same. Everything about Shine Online Banking will remain the same. It will just have additional protection. We have a desktop and two laptops, can we download this protection more than once? Hi Sally, Yes. You should download Trusteer on all of your computers. Will there be a charge or fee for this? Steve, Trusteer is absolutely free to Dupaco members. Can we download this protection to Iphones, Android phones and devices? Hi Tricia, No. At this time, Dupaco is offering Trusteer Rapport to protect desktop computers only. This is a Free download I assume and no Subscription fees? Correct, Pat. Dupaco is making Trusteer Rapport completely free to members who are enrolled in Shine Online Banking.